A colour photograph of the Whitby cenotaph. View is of the front of the cenotaph. 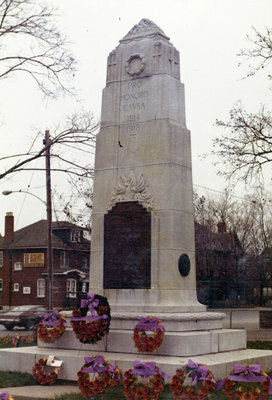 The cenotaph was erected at the south west corner of Dundas Street and Green Street and was unveiled by Colonel Henry Cockshutt, Ontario's Lieutenant-Governor, on June 3, 1924. Whitby Cenotaph, 1977, Robert Kirk. Whitby Archives D2013_005_007.